For a complete schedule of what’s happening this week, please click here. This week, our chefs from last week are preparing the cafe meal on their own! Expect delicious Sweet Potato Chili (a cafe favorite) and fresh bread straight from the oven. We’d love for you to join us! We are also forming a new team of four chefs-in-training for the cafe in October. Let Kelli know if you’re interested. Our dining room is transforming into a beautiful handcraft workshop; each week new things are adorning the mantel, the walls, and the various structures Kendera has creatively come up with on which to display things. The “Art for All” workshop happens each Tuesday (1-5) and Saturday (1-3). We’d love to have you join us. Thursday we’ll be hosting the first “Thursday Family Potluck,” a break from the regular roundtable structure of presentation and discussion. Just come and hang out and eat with us. Kids are welcome! Bring something to share if you can; if not, just come anyway. For a detailed schedule of what’s happening at the “Green House” this week, please click here. If you’re new to the Gainesville Catholic Worker and want to learn more, coming to a Thursday Roundtable is a great entry point. Come share a meal, meet folks involved with the house, and discuss a timely topic with a diverse and interesting group. This week’s Roundtable is on the City of Gainesville’s “Dismantling Racism” initiative. Bring a dish to share if you can. Kendera is busy meeting with artists and other supporters of the “Art for All” project. This week she’s continuing the origami jewelry-making and introducing beading. Future projects include painted wooden crosses, bookmarks and holiday cards, luggage tags, mosaics, and more. It’s from 1-5 on Tuesdays, refreshments are served, and all ages are welcome. This week, she’s also adding an extra work day on Saturday, between 1 and 3 (same time as the pepper pickling below). This still very hot weather is providing us with a bumper crop of peppers (and not much else…). We’ll be making southern hot pepper sauce (perfect on black-eyed peas and collard greens) and canning pickled jalapenos on Saturday, 1-3pm. If you’d like to learn and/or help, email Kelli – gvillecw[a]yahoo[dot]com, so we’ll know how many to expect. For this week’s schedule, please go here. The Roundtable on Thursday night (6-7:30) will feature guest speakers Kimberly Hunter and Vicki Mena of Gainesville’s Interfaith Alliance for Immigrant Justice. They’ll lead us in an interactive discussion on immigration and how it touches all of us. They will also talk about the “Dream Act” (S.729/H.R.1751), “a bipartisan proposal, which would create a pathway to citizenship [that requires completion of a college degree or two years of military service] for thousands of young students who were brought to the United States years ago as children. You can read more about the Dream Act here. Bring a dish to share if you can. Kendera’s Art Workshop (Tuesdays 1-5) needs more artists! If you are an artist and are willing to share your gift on a Tuesday afternoon, please let Kendera know (gvillecw[at]yahoo[dot]com). Kendera has plans to have an “open house” in November to display the art and offer it for purchase as holiday gifts – benefiting both the house and those who created it. This is in the beginning stages, so if you have any ideas – or know of someone who might – please connect with Kendera! Monday’s Farmers Market Cafe can use your help in the afternoon, serving and cleaning up between 11:45 and 3 – or a portion thereof. Please email and let us know if you are coming and when so we can schedule people effectively. 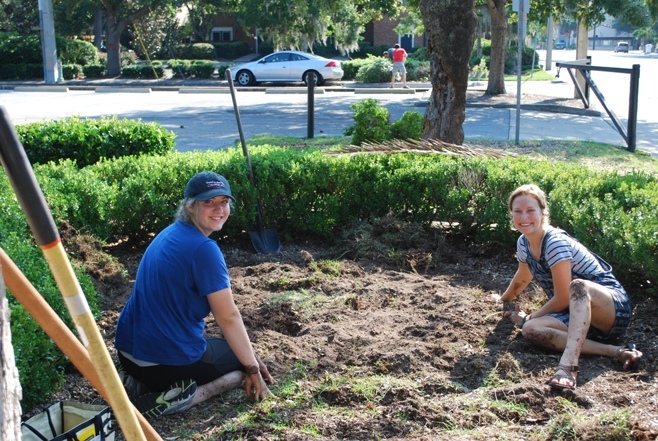 And finally, we can use your help with the Parking Lot Garden on Saturday morning from 9:30 – 11. Let Kelli know if you are up for it! PLEASE NOTE: I made a mistake on the original post regarding the date of the event at Trinity United Methodist Church. It is on FRIDAY evening! We are dismayed at the publicity a tiny “church” in our city has received for their misguided antics. They have fifty individuals on their rolls and fewer than 30 members attending on any given Sunday, yet the Wall Street Journal described them as a “mega-church,” and similar articles have fueled worldwide concern and protest. We encourage folks NOT to protest the planned book burning on the church grounds, but to attend alternative gatherings offered this weekend – a very family-friendly “Gathering for Peace, Understanding, and Hope” on FRIDAY at Trinity Methodist Church, and “A Day of Peace and Unity” sponsored by the Gainesville Muslim Initiative at the Downtown Plaza (see below for details). Maybe there will be enough of us at these peaceful, productive gatherings to lure the press in a better direction. Friday, September 10, 6:00 – 9:00 p.m. The Trinity United Methodist Church along with the support of the Gainesville Interfaith Forum, will be hosting a Gathering for Peace, Understanding and Hope. We will have activities for children of our different faiths to play together, arts and educational crafts, cultural displays, foods from various regions of the world, and a time of prayer. Make a stand for peace and unity between the different religions, cultures and ethnic groups that make up the fabric of the American society. We believe in the right of people to be different, and we believe in the right of people to be respected for their difference. Why should we focus on our differences while there is so much we can do together to overcome our challenges as the human race? Let us all make a stand together for charity by feeding the homeless , for compassion by donating blood, and for tolerance by lighting a candle . Project Downtown Gainesville will be feeding the homeless. Food will be provided by local families but if you want to help setting up the tables and serving the plates, please come by 4:30 pm. Blood Drive: Help save a life by donating blood and encouraging your friends to do the same. Life South will be present at the event with two buses. Our local hospitals are in dire need of blood and our objective for the evening will be 60 donors. Book Drive: When books are being burnt, knowledge is being lost. In this day and age, we should be expanding our knowledge or at least preserving it. The Gainesville Public Library, will be present at the event with a wish list of books. Please stop by their booth and contribute however much you can to fulfill their need. Also, if you have a collection of books that you would like to donate they will be more than willing to have it. Food Drive: Feeding the homeless one meal is a good thing, but making sure that that a system is in place for them when they will need another meal is even better. We will be collecting non perishable food items during the whole event. Everything collected will be given to local charities that provide weekly meals to the homeless people.